Meet the LB Hex™ Unplugged™: one incredibly powerful LED wash fixture! 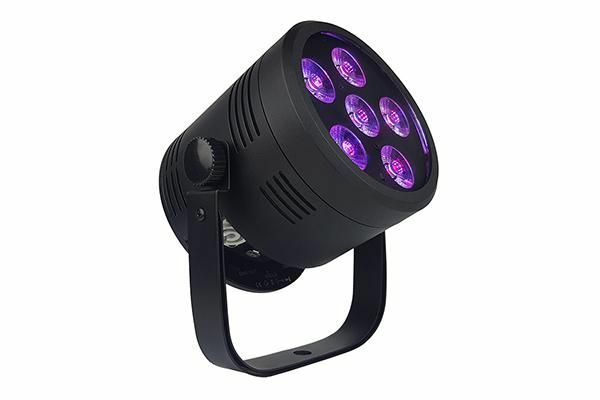 Featuring 6x 6-watt RGBAW+UV LEDs plus a lithium-ion battery system, it delivers smooth, rich colors for up to 15 hours on a single charge. It's also wiCICLE® Enabled, so you can take advantage of our wiCICLE® wireless DMX devices without any external power needed! LB Hex™ Unplugged™ rocks multiple color presets plus built-in auto and sound-active modes, all of which are available in DMX and standalone modes. Plus, it comes with a handy IR remote control! Ooh la-la! It keeps things cool and quiet with advanced convection cooling, and also features a power-save mode and onboard battery level monitor.